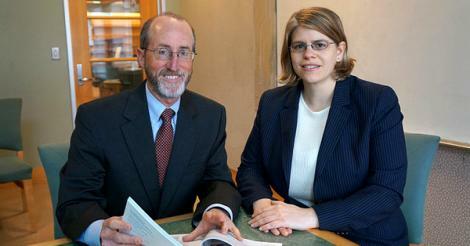 Steve Glazer and Michaela Hertle from Glazer’s campaign website. After last minute maneuvering among potential Republican candidates on the filing deadline of Friday, January 23, 2015 only one completed the process, to make it onto the ballot for the special State Senate election in District 7 on March 17. Then, a little more than a week later, Michaela Hertle, the young, unknown, first-time candidate dropped out of the race, on Monday, February 2 and endorsed Democrat Steve Glazer, the Mayor of Orinda, and unsuccessful 2014 State Assembly candidate. While it may come as a surprise to some, others expected it to happen. Republican insiders were saying, before the close of filing, that there was an effort to make sure no Republican candidates ran so that Glazer could win. The only Republican candidate who had announced prior to January 23rd, was attorney Mark Meuser, who had run unsuccessfully for the 7th State Senate seat against, then-incumbent, Mark DeSaulnier, in 2012. It’s due to DeSaulnier’s election to Congress, last year, that Governor Brown called the special election to fill the remainder of his term, through 2016. There had been pressure on Meuser to back out so that another candidate, that Republican Party leaders believed could have a better chance of winning, could run. Meuser was told that if he ran, two other Republicans would run against him to split the vote. He was also told by his contacts in the state legislature, just a week before the filing deadline, that if he didn’t run, then there would be no Republican in the race. So, he wouldn’t back down. Under California’s Open Primary law the top two candidates in the primary face off in the General Election, regardless of party. Meuser’s strategy was to have only one Republican in the race – him. The State Senate Republican Caucus strategy was to have two Republicans in the race, both of whom would have to win in the Primary to have one of them win in the General. So, with too many Republicans in the race, there was less chance for one of them to win, as they would split the vote. In the final two days, Meuser was faced what he’d been warned about, as three other Republicans pulled filing papers to run. Hertle and small business owner Fernando Navarro of Antioch pulled papers on Thursday, January 22 and Leigh Wolf, a 28-year-old Marine veteran, pulled papers on Friday, January 23, the latter two in Contra Costa. Hertle ended up being the only Republican to file. Three other Democrats had already filed, including current State Assemblywoman Susan Bonilla and former Assemblywoman Joan Buchanan, who termed out, last year, and Dr. Terry Kremin, a two-time unsuccessful Concord City Council candidate. Meuser was asked to go to Sacramento to meet with key pro-business campaign finance sources, part of what is described as the “Third House” of the legislature, in addition to the Assembly and Senate. It includes the political action committees and lobbyists with the money for direct contributions and independent expenditure efforts to support a candidate or ballot measure. They aren’t committed to a political party just the candidates and issues that benefit their interests. “I was sitting across the table from representatives of the California Chamber of Commerce and another group, both of whom said they had chairs at the table of the Jobs PAC,” Meuser said. They had done a $30,000 survey of the district and wanted to share with Meuser his numbers. But, the survey wasn’t about Meuser it was about Glazer. Only a couple questions were about Meuser. They told him that Meuser couldn’t win at all and that Glazer couldn’t win and wouldn’t run if Meuser was in the race. Following that meeting, five different people tried to talk him out of the race and said they would back him for another office, Meuser shared. While Hertle was at the Alameda County Registrar of Voters office, Hugh Bussell, who ran for Congress in District 15 against Congressman Eric Swalwell, last year, was the one who dropped off her paperwork in Contra Costa on the day of filing. He was there when Wolf, his people, Meuser and Glazer were there. Until the Tuesday before the filing, he was the Vice Chair of the Alameda County Republican Party, ran for County Party Chair, but lost. He’s still a member of the party’s Central Committee in that county. She is the one who asked for his help, knowing he understood the process from when he ran, previously, Bussell shared. There was no check in the paperwork that he had, because Hertle filed in Alameda County and paid her fees, there. When asked about the effort to clear the field of Republican candidates Bussell said, “Hertle actually spoke about why she ran, last night at the Alameda County Republican Party meeting.” But, he wouldn’t elaborate, as it was a private meeting and recording is not allowed. Kevin McGary, President of the Frederick Douglas Society said he was in attendance at the meeting where Hertle spoke. McGary then got up and spoke for about five minutes, lambasting Hertle. Believing her is “too high of a hurdle to get over,” McGary added. He went on to speak about candidates like Hertle. California Republican Party Chairman and former State Senator Jim Brulte when reached for comment said “I make it a policy not to talk to the press. I let the candidates and campaigns do that.” However, he did confirm that he spoke with Meuser the morning of the filing deadline, who had indicated to Brulte that he was going to run. “Then he didn’t,” Brulte added. Wolf, the retired Marine, who has been back from Afghanistan about a year, was a more moderate alternative to Meuser and was one of the candidates with whom staff from the Senate Republican Caucus had been in contact. The word was that Wolf would be the one getting the endorsement from the California Republican Party, which would help give his campaign legitimacy, making it easier to raise funds. Some Party activists came down from Sacramento to help the fledgling Wolf campaign. A “very seasoned operative in the East Bay,” as Wolf’s team described him, started reaching out to donors and he found money to pay Wolf’s filing fee. He was the middle man. But, Wolf has so far chosen to not go on the record for this article nor say who the operative was. A witness said that Wolf and about 10 volunteers arrived at the County Clerk’s Office in Martinez to file his candidacy papers at about 4:00 p.m. on the deadline day. The fourth Republican candidate to pull papers was Fernando Navarro of Antioch. So, he went down to the county elections office on Thursday, January 22, pulled papers and began gathering signatures. Once Navarro had done so, he got a call from Ruben Barrales, a former Deputy Assistant to President George W. Bush and the former Director of the Office of Intergovernmental Affairs, who lives in San Diego. “Ruben was my contact in the White House, when I was working on the immigration issue in 2006. He’s now working with Republican Hispanic candidates,” Navarro explained. “This is one of the most conservative counties in the Bay Area. To know that they cleared the field of Republicans in this race boils my blood like you don’t know what,” he added. Now Navarro is thinking about a bid as a write-in candidate. On the day of filing, Meuser was at the County Elections Office, sitting in his car. So was Glazer. According to a witness, Glazer had a guy there on the phone, appearing to be watching and waiting to see what Wolf and Meuser were going to do. When Wolf showed up, Glazer got out of his car and went in and filed his papers. So, a stand-off ensued between Meuser, Wolf and Hertle, who was in Alameda County. Meuser told Wolf if Wolf filed he wasn’t going to since he thought that only one Republican candidate should run so a Republican could win. At about 4:45 p.m. Wolf’s team got word that the Alameda County candidate had filed, so they decided Wolf would file. Hertle made it. She was part of the plan. With only one Republican in the race, then the plan could be achieved, when she backed out and threw her support to Glazer. However, the real plan was that no Republican would file. But, because Meuser was standing at the counter at 5:00 p.m., someone informed Hertle that she had to file her paperwork in Alameda County. Which she did. Right at 5:00 p.m. Meuser was working with the county elections staff to complete his paperwork, including his ballot statement. They were also dealing with Wolf’s paperwork. As long as a candidate had started their paperwork by 5:00 p.m., they were fine to complete the process after the deadline. Since it appeared there would be two other Republican candidates in the race, Meuser chose not to file. Meuser told Wolf, “fine, I’m not,” gave Wolf his business card and offered his campaign headquarters for Wolf’s use. At 5:05 p.m., according to one witness, Wolf’s middle man got a phone call from the mystery man, that the candidate in Alameda (Hertle) didn’t make it, that they were not funding only one candidate, but that they were going to fund two candidates. He said Hertle hadn’t filed and that she didn’t have enough signatures. The middle man who was holding the check for Wolf’s filing fees, took the check back from the clerk’s window and walked out. Nyna Armstrong, Chairman of the Contra Costa County Republican Party then told Wolf her organization would pay his filing fee. Someone really discouraged Wolf, telling him, he’d look like a fool and get beaten bad. So, Wolf didn’t complete the filing and he turned and walked out the door of the Elections Office, as well. What Wolf’s team and Meuser didn’t know was that Hertle had more than enough signatures to qualify. So, Wolf was talked out of it, based on a lie. Meuser says he would have turned around and paid his filing fee and filed, had someone called him about what happened, as he was driving away. After she became the only Republican candidate to file her papers, Hertle was called by a variety of Republican leaders offering their assistance. She was also contacted by the media, including the Herald, several times via email, phone calls, texts and Facebook messages. But, she has refused to respond to any messages. Then, on Monday, February 2 at 12:29 p.m., in a press release received via email, Glazer’s campaign announced Hertle’s withdrawal from the race. “With Hertle resigning from the race, Glazer faces three other Democratic opponents on the special election ballot. The primary election will be held March 17. Glazer serves as “a Trustee of the California State University 23-campus system. During his service on the City Council of Orinda, he has balanced ten budgets without ever taking a salary,” stated his campaign’s news release. One of the mailers supporting Glazer, paid for by Bill Bloomfield. “I’ve been in this business for a while and people say all kinds of things,” he added. Asked if he was waiting in the parking lot at the Elections Office, he said “I was, yes. “Mark Meuser and I were chatting in the parking lot. We were lamenting that our party leaders weren’t happy with us,” Glazer added with a chuckle. “I wasn’t recruited to run by anybody” he added. Glazer says he took a big risk and endorsed Republican Catharine Baker in the General Election for last year’s Assembly race. “I did it because I thought it was the right thing to do,” he stated. Now he’s being targeted by both the Democratic Party and unions, spending thousands on mailers attacking him. Glazer has posted copies of the nastygrams on his website at www.GlazerforSenate.com. I entered the race for SD7 because I hoped to inspire a new generation of Republicans to rise up and be heard. We all discuss politics every day at our dinner tables and with our friends. We lament about how policies coming out of Sacramento affect our personal lives, our communities and our businesses, but so few are willing to do anything about it. I wanted to prove that one person can make a difference. With this said, under the current circumstances, the chance of my winning this race is slim, at best. This is my first effort at seeking elected office. It has become evident that I cannot establish the funding, name recognition and support required to win this election against this field of Democratic candidates within a six-week period. I am endorsing Steve Glazer for California State Senate District 7. Mr. Glazer has proven that he can work with Republicans and Democrats alike to find common sense solutions to our state’s needs. Like me, he is a fiscal conservative. He supports pension reform and school reform. He is not beholden to labor or other special interests, as seen by his opposition to BART strikes. 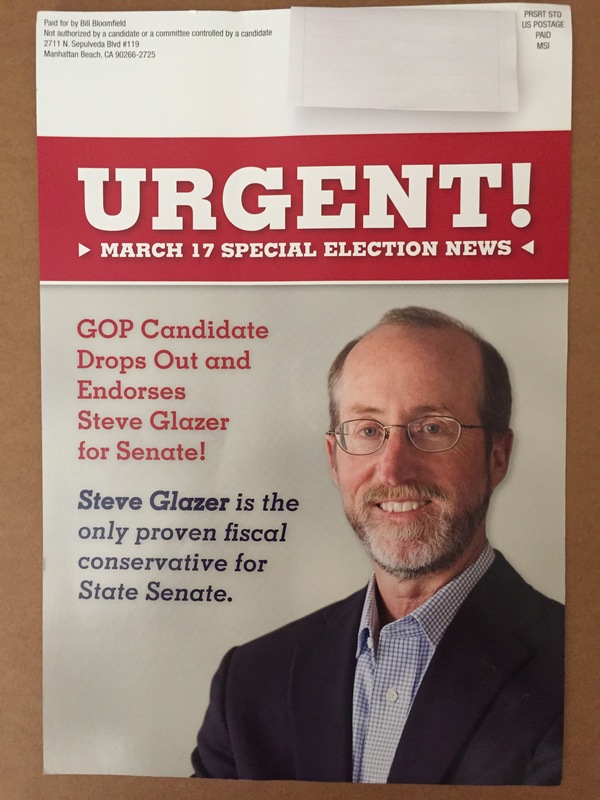 I urge my fellow Republicans to vote for Steve Glazer. We have more commonalities with him than differences and he can win this race. It was learned this past week, that the person who wrote the check for Wolf’s filing fees came from someone who had no contact with Hertle.So, if there was someone in touch with Hertle and/or Glazer, whomever called and lied to Wolf’s middle man might be him. So, who was the mystery man? Meuser says it has to be Matt Klemin, External Affairs Director – Tribal Liaison for the California State Senate Republican Caucus, who is Republican State Senate Leader Bob Huff’s man. “Klemin told me ‘Mark, I see that you have not, yet filed your paperwork. When are you going to do so?,’” Meuser shared. That made it appear to Meuser that Klemin was the one pulling the strings behind the scenes with the other potential Republican candidates. Meuser said he told Klemin about Hertle’s candidacy during their conversation. Peter DeMarco, of the State Senate Republican Caucus staff spoke on behalf of Huff and Klemin, who said he could not go on the record for this article. DeMarco confirmed that Huff did speak with Meuser, but it was mostly staffers who were in touch with potential candidates, including Meuser and Wolf. The strategy was to have two Republicans in the race, hoping both would make the run-off in the General Election, as that was viewed as the only way a Republican, who wasn’t well-known or well-funded, could win. “In 2014 the Senate Republicans won three elections in Democrat majority districts because we had the right, outstanding candidates who were the best fit for the districts,” DeMarco explained. “A well-known candidate who would be strong financially, and could appeal to Republicans and independents, based on the voter registration of the district,” was who they were looking for. He said they had no conversation with Hertle. “The first time any of us had heard her name was Friday night, after she had filed,” he stated. Rohit Joy, Treasurer of the Contra Costa Republican Central Committee, shares Meuser’s view. He said he does not know Hertle, personally, but heard she was one of the two Republican candidates recruited, because Meuser would not back out. “The Senate Republican Caucus recruited Wolf and Hertle,” he stated. When asked how he knew that, Joy said that “staffers from the caucus were at the Contra Costa Elections Office on Friday afternoon,” the day filing closed. “I’ve spoken with people on our central committee who were at the office, that day,” Joy added. But, he was not there. “County Party Chair Nyna [Armstrong] was there at the Elections Office,” he offered. Joy continued with his view of what occurred. “They’ll never admit to that because it goes against the CRP Bylaws and their mission, but I believe that to be the case,” Joy said. “She [Hertle] is the only one who can be blamed for the actions she’s taken,” Joy concluded. The Contra Costa Republican Party Central Committee will not be endorsing Glazer nor any other candidate in the race. “I’m livid,” is all Chairman Nyna Armstrong said, before going off the record until a later conversation, after she had met with her Executive Committee, that evening. “The Republican Party of Contra Costa County was in support of a candidate for the State Senate District 7. Unfortunately, this candidate chose to not run for the office at the last minute. Subsequently, Micheala Hertle of Pleasanton chose to file for the race; she is still on the ballot, but is not campaigning. The Republican Party does not endorse any candidate in the race, but we remind Republicans that it is our duty and privilege to vote. We further advise our members to vote for the candidate who they feel best matches their personal beliefs and has the views they feel more closely reflects views held by the Republican Party. 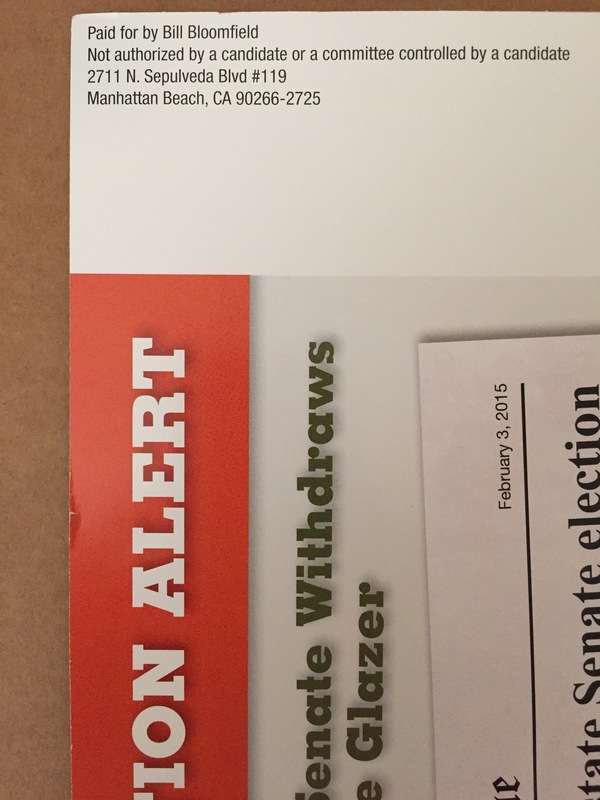 One of a variety of mailers supporting Glazer’s campaign paid for by Bill Bloomfield. Three of six mailers sent to Republicans supporting the Glazer campaign, that arrived, in the past few weeks have touted Hertle’s exit from the race and her endorsement of his candidacy. Bloomfield is currently acting Chairman of Baron Equities, a real estate investment firm with ownership and management interests in residential, commercial, retail and industrial properties in California and the U.S. Between 2001 and 2011 he spent $2,231,000 to support candidates and ballot measures in California and spent over $7 million on his own failed Congressional race in 2012. According to his website, www.billbloomfield.com, he was also a key player in creating California’s Citizen Redistricting Commission, which redrew the district boundaries in 2011, as well as the current Open Primary process where the top two candidates, regardless of political party, go on to compete in the General Election. Bloomfield says he and his wife, Susan became familiar with Glazer, during his Assembly race, last year. In addition to the funds spent on the independent mailers, they have each contributed $4,200 to Glazer’s campaign. Glazer has picked up the endorsements of former and current Republican leaders. They include State Assemblywoman Catharine Baker, who was just elected, last November, who with Democrat Tim Sbranti, beat Glazer in last June’s Primary. In addition, former Congressman Bill Baker and State Senator Richard Rainey, as well as local elected officials including San Ramon City Councilman Dave Hudson, Danville Town Councilwoman Karen Stepper and Antioch’s own City Clerk Arne Simonsen, have endorsed Glazer. “I’d rather take a chance getting a guy willing to reform education, reform the pensions, willing to be a fiscal conservative who doesn’t support the rail to nowhere and doesn’t support the underground peripheral canal,” he added. Charles Munger, Jr. is the wealthy son of billionaire Charles Munger, Sr., who is the partner of Warren Buffet, one of the two wealthiest Americans, along with Bill Gates. Munger, Jr. has been working to influence Republican primary elections in California for a few years, by financially supporting more moderate candidates and ballot measures, spending millions of dollars of his own money. Just like Bloomfield, he supported Proposition 11 in 2008, which created the Citizens Redistricting Commission, then Munger, Jr. contributed over $12 million to help pass Proposition 20 in 2010, adding congressional districts to the commission’s responsibility. In 2012, Munger contributed almost $29 million to the Small Business Action Committee which opposed Prop. 30, the Sales and Income Tax Increase Initiative, which passed, and supported Prop. 32, labeled the “Paycheck Protection” Initiative, which failed. That initiative would have banned corporate and union contributions to state and local candidates, contributions by government contractors to the politicians who control contracts awarded to them, and automatic deductions by corporations, unions, and government of employees’ wages to be used for politics. He’s the former Chairman of the Santa Clara County Republican Party of Silicon Valley. Others in the party believe Munger may be the mystery man. That is partially due to Bussell’s help with Hertle’s filing, and his connection to Sue Caro, the immediate-past Chairman of the Alameda County Republican Party Central Committee, and their connection to Luis Buhler, an activist in the Republican Party in the Bay Area, who is considered Munger, Jr.’s right-hand man. They also point to Glazer’s connection to the Jobs PAC, which is part of the California Chamber of Commerce, which they claim is funded by Munger. Buhler didn’t return messages for this article. But, a state party insider, who chose not to be identified, stated flatly that Munger had nothing to do with clearing the field of Republican candidates in the special election. Further evidence is that none of the mailers supporting Glazer have been from Munger nor the Small Business Action Committee, nor have their been any contributions to Glazer’s campaign from Munger. Caro spoke at length about Hertle. However, Meuser remembers things differently. He says he spoke with Hertle at about 2:00 p.m., on the filing deadline, and she told him she didn’t have any problems with his positions on the issues. Meuser also says he told Hertle that if she was going to file, he would most likely step down and not file. “So it shouldn’t have come as a surprise to her that I didn’t file,” Meuser added. “Glazer reached out to her. When she heard his positions on the issues she agreed with many of them. Now everyone is twisting this to their advantage,” Caro said regarding Hertle’s withdrawal and endorsement of Glazer. Regarding Meuser’s potential candidacy, Caro shared what she knew. “I told Mark that if he was the only candidate I would support him,” she stated. “But, he refused to back out. He kept stalling and stalling and putting off the decision,” she added. “People in the business community don’t want either Bonilla or Buchanan to win so they’re going all out to help Glazer,” she added. “Party loyalty in the Bay Area is lower on the totem pole than where people come down on the issues,” she shared. When asked about Republicans just waiting until next year to field a candidate, Caro’s not sure if a Republican can win the seat in 2016. “Unless we had someone like [Contra Costa District Attorney] Mark Peterson,” she said. He endorsed Catharine Baker in the General Election. I did it because I thought it was the right thing to do. While he was working with the Jobs PAC, they worked against two incumbent Democrats. Because of that, the State Labor Federation put him on their “do not patronize” list, Glazer stated, which means no one was to do business with him nor support him for office. Now they’re pulling out all the stops to defeat him with a variety of mailers. The nasty-grams can be viewed on his website at www.glazerforsenate.com. Who paid Hertle’s filing fee? One way to possibly discover who, if anyone, was pulling the strings with Hertle is to find out who paid her filing fee of $971.97 to the California Secretary of State. That office has not responded to a call asking the question of whose name was on the check. Since Hertle isn’t talking and the fee was less than the $1,000 threshold to meet the requirements for campaign disclosure, she never has to file a campaign finance report. So, we may never know who paid her fee. But, although she paid the filing fee, Hertle didn’t pay to have a candidate statement in the ballot materials, which is the lowest cost way for a candidate to get their message to all the voters. So, that makes it obvious she had no plans to run a serious campaign, or stay in the race. 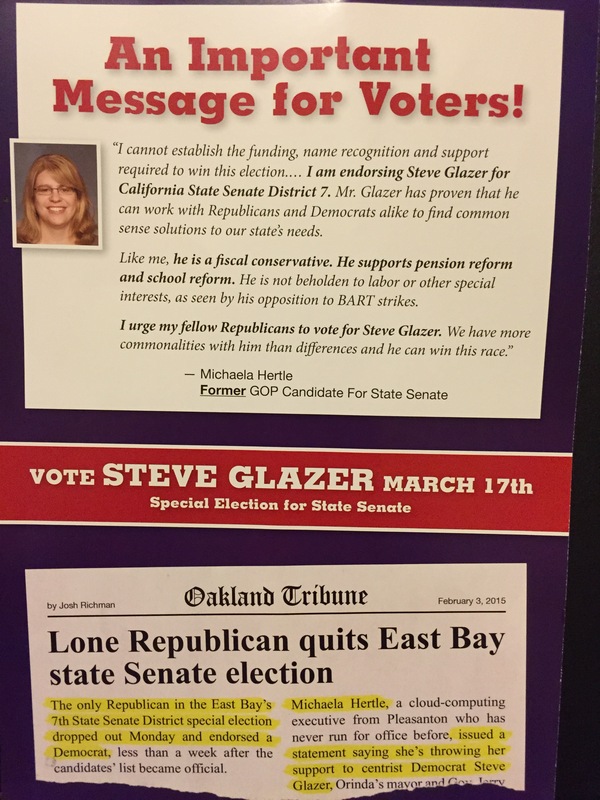 The fact that the “lone Republican” dropped out of the race and has endorsed Glazer seems to be the main point being hammered home with Republican voters. But, Hertle’s endorsement doesn’t mean much and carries little to no weight. She didn’t raise any money nor had she even started to campaign before dropping out. Plus, her name will be on the ballot so those who don’t get Glazer’s message or want to file a protest vote can still vote for her. Republican Party activists considered her a no-name in both the party and politics in general, with no campaign or public office experience, and having merely filed some papers, paid a fee possibly with some mystery man’s money, then posted a message on her Facebook page that she decided not to run and support Glazer. The Democrat candidate who wins this year will face election for a full term next year, that could possibly include facing a Republican candidate, giving the voters a choice between candidates from the two major parties. Based on the voter registration in the district, according to both local and Sacramento-based campaign experts, it is winnable by a Republican candidate, if they’re well-known, a strong campaigner and can raise the needed funds. According to experts, any time a district is less than 50% Democrat it’s winnable by a strong Republican candidate. Plus, since many of the Democrats in the district lean conservative and are not strong, pro-union supporters, a Republican candidate starts off with over 40% of the vote. Adding to that, support from those with No Party Preference and a Republican candidate could win. Sources inside the party say they will be looking to recruit a strong Republican candidate to run next year, against whichever candidate wins, this year. But, others are concerned that in a presidential election year, with more Democrats turning out to vote, it will be more difficult for a Republican to win and beat an incumbent Democrat. So, they’re backing Glazer, this year. While it appears some mystery man was pulling strings to clear the field of Republican candidates and help Glazer win, after multiple conversations and three weeks of research, we don’t know, yet who he is. We also don’t know who paid Hertle’s filing fee. She’s not talking. First, we know that mystery man lied to Wolf’s team about Hertle’s signatures. We know that Wolf was talked out of the race and that Meuser was pressured out of the race, both on the final day of filing. We know Glazer waited until the last day to file. We know that Hertle filed, then withdrew without every campaigning, and endorsed Glazer, when she could have just withdrawn and not made an endorsement, and refuses to speak to the media about it. We also know she did the minimum required to become a candidate by merely paying the filing fee, but not for the low-cost ballot statement. So, she was never planning on being a serious candidate or staying in the race. We also know that Bill Bloomfield, a wealthy, Southern California business man, who is a disgruntled, former Republican, and unsuccessful candidate for Congress, is trying to influence the special election in Contra Costa and Alameda Counties and help Glazer get elected. Finally, we know that Wolf’s operative is the only one who may know who the mystery man who called and lied about Hertle not having enough signatures to complete her filing. Until Wolf shares who the operative was and he says who called him, we can’t know who the mystery man might be. In a brief conversation on Saturday, February 28, Fernando Navarro, the man from Antioch, said he may still run as a write-in candidate. If so, he has until Tuesday, March 3 to file. If he does, it could upset the Glazer victory strategy – whose ever it was – for this election, now a little more than two weeks away. NOTE: This article was begun the day Hertle dropped out of the race. But, it has taken this long for the complete investigation and to get people to speak on the record. This entry was posted on Sunday, March 1st, 2015 at 11:51 pm and is filed under News, Politics & Elections. You can follow any responses to this entry through the RSS 2.0 feed. You can leave a response, or trackback from your own site. If Meuser, Wolf or any other Republican was serious about running for SD-7, they would have entered the race. As it is, Bonilla and Buchanan are going to split most of the “party-line” Democrat vote. Conspiracy theories are good fodder, but a serious GOP candidate would have filed their papers. I believe Hertle just saw that she was a weak candidate with no elected experience and opted to bow out and endorse Steve Glazer, as many other prominent elected and former elected Republicans have done.